AskaVocalCoach.com was conceptualized and created by Vocal Coach Ken Taylor in efforts to achieve his dream of helping as many singers as possible develop their talents. Ken Taylor has been a professional singer since the age of 15 and has been assisting others in their vocal journey since he was in college. He started teaching full time at the age of 23, and presently shares his knowledge with his clients through skype, and also out of his studio in Orlando, FL. Since then, he has created Singing Tips Blog, a completely free resource for singers looking to improve their voices and abilities that got over 50,000 page views last year alone! Singing Tips Blog is a website that’s available to everyone, and contains numerous free articles with guidance on how to improve ones singing and performance abilities. Unlike Singing Tips Blog, which was designed to be a general resource, the purpose of Ask a Vocal Coach is to cater to the individual singer’s needs. In this site, Ken will answer the most pressing questions that you may have as a singer. Over time, it will also serve as a complete singers resource, providing quality insight on nearly any question one might have. All you have to do is search the site, or look through the categories to find the information that would be most helpful to you. Finally, it gives you the opportunity not just to see my answer to the question, but to participate in the conversation, sharing your own stuggles, successes, and experiences in the comment fields below each post. Put all of this together, and you’ve got a community of thousands of singers, all helping each other to further develop their talents and passion for singing. 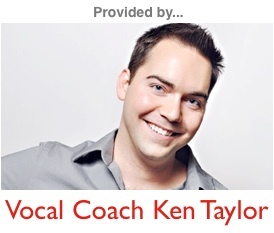 This website is just another part of Vocal Coach Ken Taylor’s vision to help singers. If you’d like to see a video on how you can join and help grow this community, please visit the Join the Community page. Otherwise, thanks for visiting and happy singing!